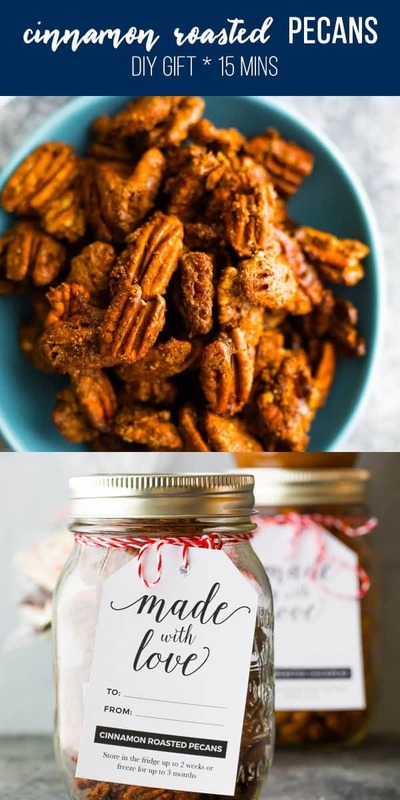 Sweet and crunchy cinnamon roasted pecans are a holiday classic and make a great DIY Christmas gift! 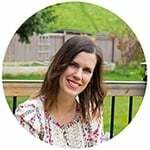 This winter, I’m sharing five easy DIY Christmas gifts, the kind that even us ‘not so crafty’ people can pull off. 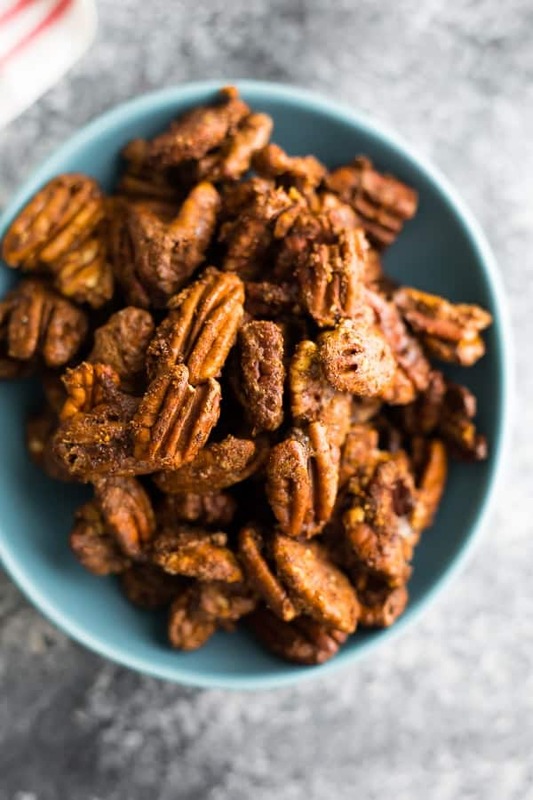 These classic cinnamon roasted pecans are always a holiday favorite, and also make for a super easy homemade gift. Nuts are a staple at the holidays, and it’s fun to change up the flavors a bit! 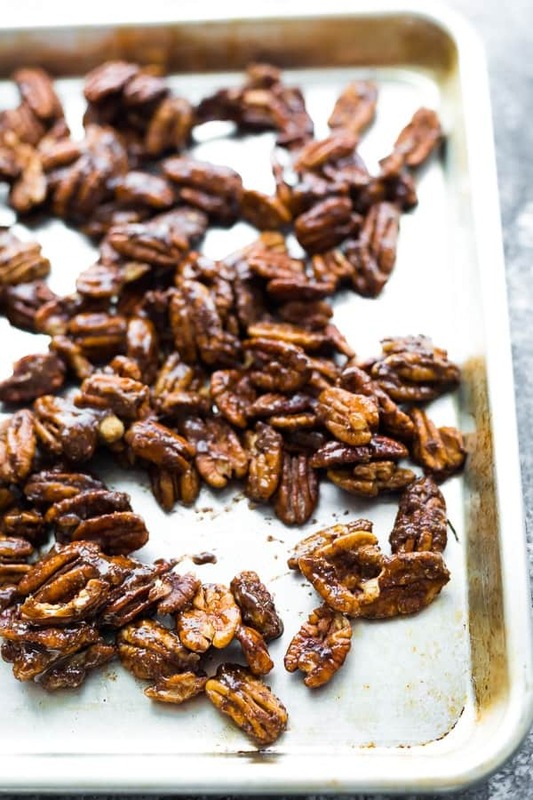 I added cinnamon, cardamom and nutmeg to this roasted pecans recipe, and they took a grand total of 15 minutes to prep and bake! Let me tell you– these are highly addictive! Put them in a bowl at a holiday party and watch them disappear! They also make a great hostess gift. 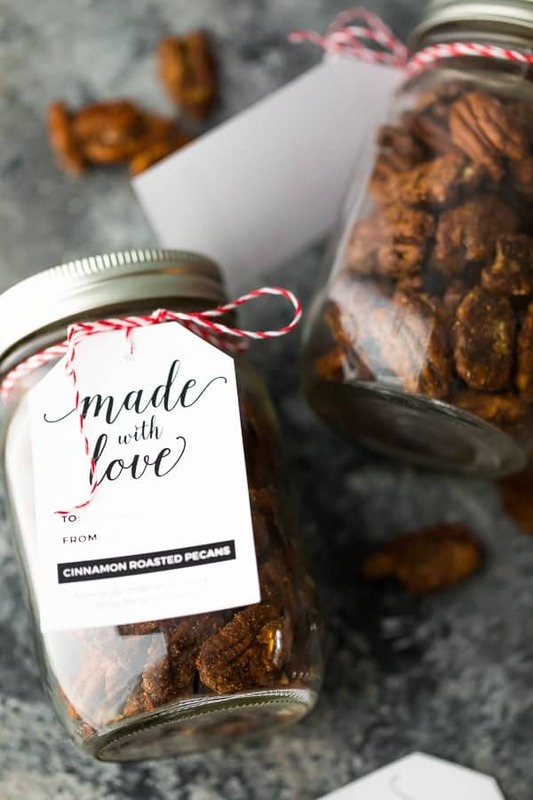 Get your free printable Cinnamon Roasted Pecans Gift Tag here! you can have them prepped and baked in under 15 minutes! I tried this recipe a few different ways (with and without the egg), and the best results were by far with the egg white. Thanks to the egg white, these roasted pecans get nice and crispy (rather than soggy) as they cool! Toss pecans with brown sugar (you may swap with coconut sugar), cinnamon, nutmeg, cardamom, egg white and a generous pinch of flaky sea salt. Bake at 350°F for 8-12 minutes. I’m not kidding, it’s really that easy! 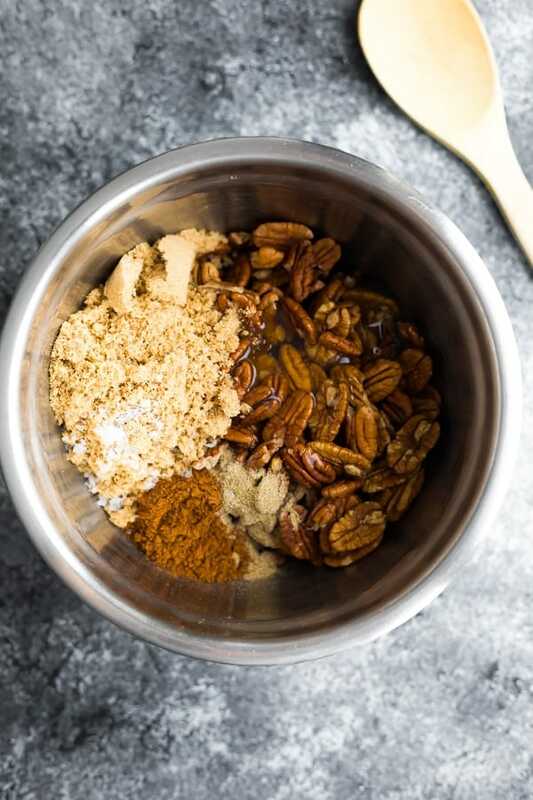 Can I swap the brown sugar for an unrefined version for these cinnamon pecans? Yes, you may swap for coconut sugar, however liquid sweeteners like maple syrup or honey do not work for this particular recipe. How long do these cinnamon pecans last for? We kept ours at room temperature for 10 days with no issues. I recommend storing in the fridge for longer term storage. Heat oven to 350°F. Line a baking sheet with parchment and set aside. In a large bowl, toss together the pecans, egg whites, cinnamon, cardamom, nutmeg, brown sugar and salt. Spread nuts out on the baking sheet, then bake for 8-12 minutes...keep an eye on them at the end so they don't burn! 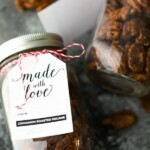 Allow to cool completely, then transfer to a storage container or gift bag.